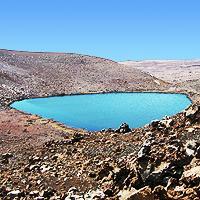 This is a short, one mile round trip walk that takes you to Lake Waiau at 13,020 feet above sea level. 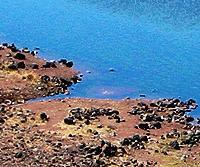 This lake is near the summit of Mauna Kea and a short distance from the astronomy domes. 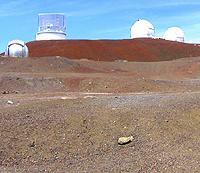 This is an excellent trail to take while visiting the astronomy centers and the beauty of the summit of Mauna Kea. 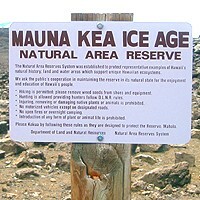 This trail is near the summit of Mauna Kea, off of Saddle Road. Take Highway 200 (Mamalahoa Highway) to the junction of Saddle Road near mile marker 6. Turn on Saddle Road (you can only turn one way) and drive carefully to the 28 mile marker where you will make a left on to Mauna Kea road which takes you to the summit. There are a number of ways to get to Saddle Road from Hilo, but we will suggest the new Puainako Extension that was recently added. Take Kanoelehua Avenue to Puainako Road, which is just past Wal-Mart and next to the KTA Supermarket. Take Puainako mauka (towards the mountains) into Hilo. Continue on Puainako until it dead-ends at a light. At this point Puainako makes a slight jog. Make a right hand turn at the light and immediately get in the left lane and turn left onto the new Puainako extension. Follow this extension, as it now becomes Saddle Road. Continue carefully on Saddle Road to the 28 mile marker where you will make a right on to Mauna Kea road, which takes you to the summit. At the junction of Saddle Road and Mauna Kea Road note that there is a large, green cinder cone. This large cone is Pu'u Huluhulu (Hairy Hill) (not to be confused with another hike with the same name in Hawai'i Volcanoes National Park) and is an excellent and quick hike to the top. 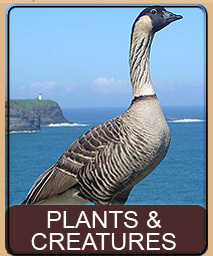 Many of the plants and birds you will see within the protected cone are mostly native. The fence around the cone is to keep the wild pigs and goats out of the protected area, so please close any gates you open. There are two ways into the cone; first, just across from Mauna Kea road is a short driveway to the cone that ends with a little hunters station. There is also a bathroom here. Park in this area and walk through the gate. Skirt around the base to the right of the cone, continuing around the right along the maintenance roadway. Along the back you will see where the cone once provided raw materials for fill and roads, continue past that and the road goes upwards all the way to the summit of the cone. Alternatively, just past Mauna Kea road, towards Hilo, is a road made of red lava which goes towards Mauna Loa. This is the road to the summit of Mauna Loa. Take that road and you will quickly come upon another gate next to the cone. Park at the gate and go through. There is a rough and steep trail here to the summit, and a number of other interesting trails around the backside of the cone. Please respect the cone as it is considered sacred by the Hawaiians as well as protected by the park system. Now that you have had a nice hike to Pu'u Huluhulu back to Mauna Kea road we go. Take Mauna Kea Road up the side of the mountain to the Mauna Kea Visitors Center at the 6.2 mile marker at 9,300 feet. You should stop at the Visitors Center (even if it is not open) for at least 30 minutes to allow yourself to acclimate to the altitude. This is to avoid altitude sickness, which is a huge possibility near the summit due to reduced oxygen. The Visitors Center is open year round from 9:00 AM to 10:00 PM and offers a free movie and information about the observatories at the summit, as well as coffee, bathrooms, and a gift shop. 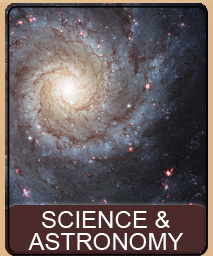 On clear evenings the Visitors Center offers free star viewing through a number of smaller telescopes. Once you have spent at least 30 minutes at the Visitors Center, put your vehicle into 4-wheel drive and continue up the mountain. There will be warnings if the mountain has snow, so pay attention as the road may be closed due to weather conditions. The road is dirt for a few miles and although usually well maintained is narrow with steep drops and no guardrails. Drive cautiously and slowly as there is often quite a bit of traffic going up and down the mountain. Continue on the dirt road and after 5 miles it turns back to pavement for another 4 miles up to the top of the mountain. Near the top you will see the observatories and the road will "T" with the choice of going left or right. Go left and immediately, after the left turn, there is an empty gravel area to your left. Pull down into this area and park. We recommend, at this point, going back to the road and walking along the roadway, on the right hand side, back the way you came. You will come upon a wooden informational sign about Mauna Kea in general, and the trail starts at that point and goes off into the distance around the large cone you will see. While this hike is a simple one mile trail, it is at high altitude with no shade. Not only is there a lack of oxygen, making movement slow and breathing difficult, the higher altitude also means there is a greatly increased possibility of sunburn. We recommend sunscreen and a wide brim hat and boots. The summit often has snow during the winter so dress accordingly. Make sure to bring and drink lots of water, as dehydration is a risk at high altitude. This is a high altitude walk. To help avoid altitude sickness it is advisable to stop at the Visitors Center at the 9,000 foot level for a minimum of 30 minutes to allow your body to acclimate to the altitude. The actual hike is at 13,020 feet above sea level and above 40% of the Earth's atmosphere. Do not do this hike if you have any respiratory or breathing difficulties. This hike is not recommended for small children. Many of the rental car companies have you sign a paper saying you will not take rental cars on Saddle Road. 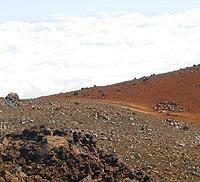 Furthermore, it is advisable to have a 4-wheel vehicle for going above 9,000 feet on Mauna Kea. Harpers Rental rents 4-wheel vehicles that are fine to take on Saddle Road. Other than that, we do see non-4-wheel regular rental cars all the time on Saddle Road and the summit above 9,000 feet. However, the summit road is steep and coming down can damage your brakes. Use low gear and avoid overly braking on the downhill ride. Beware of cows - this is open rangeland and cows have been known to sleep in the roadway. The cows are often nearly invisible during foggy weather or as you go up and through the cloud layer. Saddle Road is a narrow twisty and turny road. It is a very dangerous road and accounts for many accidents a year, mostly due to excessive speed on sharp curves. The Hilo side of Saddle Road is especially dangerous due to the many hairpin curves and steep downhill grade. It is advisable to always have your lights on and be careful for oncoming traffic. 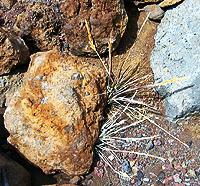 The trail is mostly level and consists of small loose lava rocks. 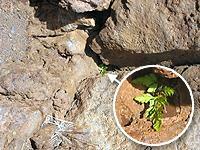 You will need to climb up and down larger rocks in some areas. Be careful not to slip or fall. Much of this area, including the lake itself, is sacred to the Hawaiians. 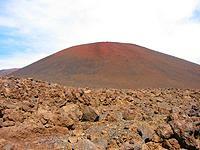 Stay on the trail and do not climb the nearby cinder cones. Do not enter the lake or disturb the lake or surrounding area. Assuming you followed our directions above, you are now standing on the roadway with the wooden sign to your right. 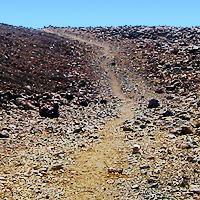 The trail is just past the sign and goes away from the summit and bends around the nearby cinder cone. Starting on the trail, all the ground you are walking on is the fallout of fountaining lava from the nearby cones. This molten rock was ejected high into the air and broke apart into small pieces on the way down. A glacier period following the eruptions further crushed the rocks to the finer rough pebbles that you are walking on. 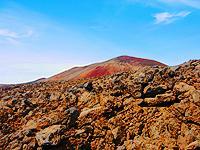 Continue on the trail around the cinder cone, appreciating the bright red colors of the nearby cones, a result of the chemical and mineral composition of that particular lava flow. As you round the large cone that is on your left you will see a ridge. As you approach the ridge you will see Lake Waiau on the other side, and below, the ridge. Continue on the trail as it takes you over and down the ridge and a bit away from the lake. The trail intersects another trail, which is an alternate, though longer path to Lake Waiau. Interestingly enough, both the trail you are on, and this other trail were once the unpaved road, created in the 1930's, to the summit. When the paved road was put in place in the 1960's the old road became part of a trail system from the Visitors Center at 9,000 feet to the summit of Mauna Kea. At the intersection, take the trail to the right and down to the lake. 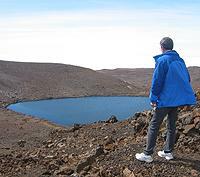 Lake Waiau lies in the center of the Pu'u Waiau cinder cone. This cinder cone last erupted about 65,000 years ago. Along with the fine ash and rock ejected from the cone was sulfur, which converted the other materials to a fine clay and silt. This resulting silt sank into the normal porous lava rock causing a watertight seal to coat the base of the cinder cone. 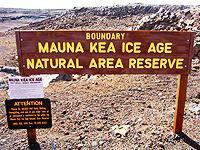 About 30,000 to 35,000 years ago, Mauna Kea was covered by a glacier that lasted about 20,000 years. 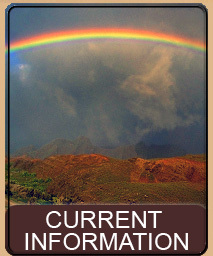 There are indications that there were eruptions under the glacier and Pu'u Waiau may well have erupted under the glacier above it, contributing to the buildup of trapped material. A permafrost layer remains today, near the lake at a depth of 30 feet. 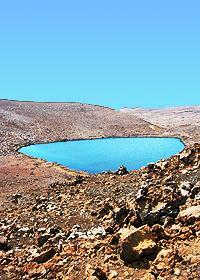 The lake itself is the shallowest lake in the Hawaiian Islands. At a mere 10 to 15 feet deep and about 1.8 acres in size, the lake does not contain a huge amount of water. Even though the glacier, probably the original source of the lakes water, has left thousands of years ago, the lake is never dry thanks to rain and melt off from winter snows. The lake normally freezes over during the winter. There are, of course, no fish in Lake Waiau. There would have been no natural way for fish of any type to reach that altitude, and survival of introduced fish would be highly unlikely. However, the high altitude of the area exposes it to the same high levels of ultraviolet radiation that your body is now exposed to (you did bring the sunscreen didn't you?) and this causes the benthic mats (dense areas of algae and bacteria) within the lake to produce very specialized amino acids, basically their own sunscreen, that protect them from the extreme ultraviolet radiation. Even though there are no fish, there are insects in the area. You will certainly spot flies buzzing about, but there are also many other insects, some found only in this spot, lurking under rocks and in the lava cracks. You will also spot the occasional small fern or barely hanging-on grass that was unfortunately blown up this high and forced to eek out a living in this barren and hostile landscape. Thousands of years after the lake formed, the Hawaiians discovered the Big Island and eventually the lake. Hawaiian mythology associates four goddesses, described as "maidens with white mantles", with the snow covered mountains of Mauna Kea and Mauna Loa. 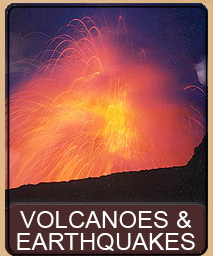 The goddesses were known to be both very beautiful as well as extremely intelligent and were all bitter enemies of the goddess Pele. The four goddesses represented the eternal struggle between fire and water, heat and cold. Because the water run off from the mountains also provided irrigation and fresh water to the lower lands, these goddesses of the mountain were well regarded. Waiau, the namesake of the cinder cone, was one of these four goddesses; the others were Lilinoe, Kahoupokane and Poliahu. Unfortunately, few of the legends specific to Waiau remain. Most interestingly, while the lake is only 10 to, at the deepest, maybe 15 to 20 feet deep, it was known as The Bottemless Lake and was thought to be one of several entrances to the Underworld on the Big Island. 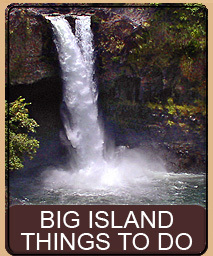 The actual word, waiau (why-ow) means swirling water of a current and wai'au'au (why-ow-ow) means bathing place, which would lead us to assume a natural connection with the goddess's name and the lake itself. You can imagine, that with a goddess associated directly with the lake, and the connection of the four snow goddesses with life giving water, that Lake Waiau was indeed a most sacred place. The water of the lake was known as the most sacred of Kāne's waters in all of the islands of Hawai'i. The Hawaiians who lived in Waimea also used the lake for placing the piko (umbilical cord) of newborn babies into the lake. The Waimea Hawaiians viewed Mauna Kea as special to them and disposing of their newborns piko into the lake was thought to bring strength and good fortune to the child. It is thought that this practice may still continue today. One can also imagine that given the sacredness of the waters of the lake, that this would also be considered to be a perfect burial ground, full of energy and mana (spirt, power). Indeed, burial remains have been found in surrounding areas of the lake. 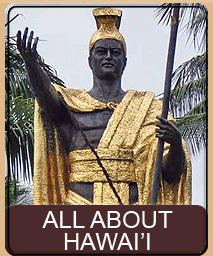 With this much religious and cultural significance we must be careful to protect this land, sacred to the Hawaiians. The way back to your car is the way you came. Simply return along the same trail. If you are curious about the other trail at the intersection... as you head back down from the summit, on the other side of the large cinder cone you walked around you will see, on the left side of the road, a parking area. If you park there, and cross the road, you can see the trail snaking up and over another ridge. That is the trail you intersected with. While that is a fine trail, the way we had you go is shorter and involves less of a climb than this alternative trail. It is, of course, possible to do both trails as a giant loop, returning to your car along the roadway. This page is named 'Hikes.lake'. Can't Find It?